I've obviously been remiss in publishing more Bluetooth case studies. A thousand apologies and a promise to post more consistently. 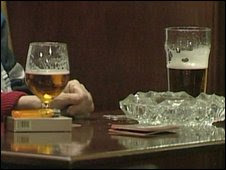 First up, coverage of an anti-drunk driving campaign in Northern Ireland. This campaign is especially smart because it adheres to one of the chief maxims of effective Bluetooth marketing campaigns--collateral advertising included. Not only will Northern Ireland revelers receive Bluetooth alerts, they'll also see anti-drunk driving advertising in pub restrooms and even glowing boxes in main gathering areas.